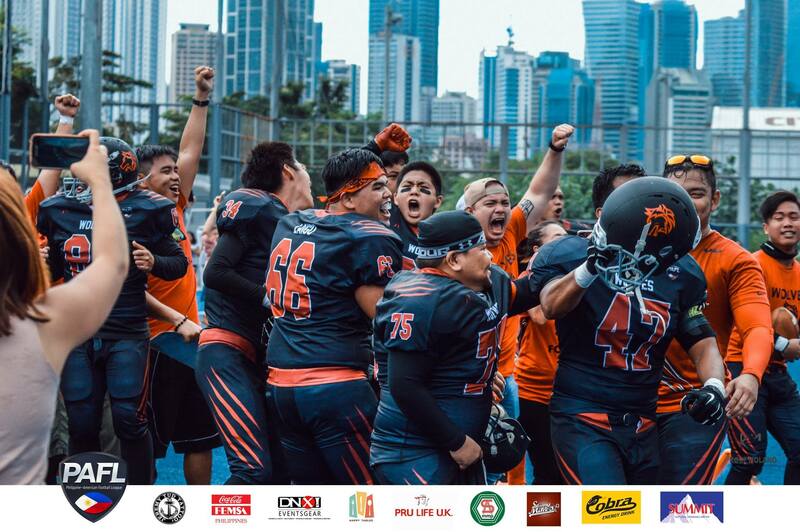 Makati City – The Philippine American Football League (PAFL) ended its second season last November 19, 2017 at Blue Pitch Circuit Makati. Football fans came through and showed support for both the Wolves and the Cavemen. They watched as both of these teams dominated each other with their athleticism and wit. The kick-off started and the wolves offense made their first play with a pass to wide receiver Iaisaiah Uggadan. Wolves receiver Joshua Gaita made a 10-yard gain. David Jumola, Wolves running back, gained more yards with their run plays and was able to get a 1st down for the pack. An encroachment violation was called on the Cavemen defense which gave an advantage to the pack. Wolves quarterback Luke Zetazate made a trick run play to Jumola resulting in the 1st touchdown of the game. The pack’s extra point by kicker Mark Hill was good and the score at this point was at 7-0. Cavemen offense started at the 30-yard line. 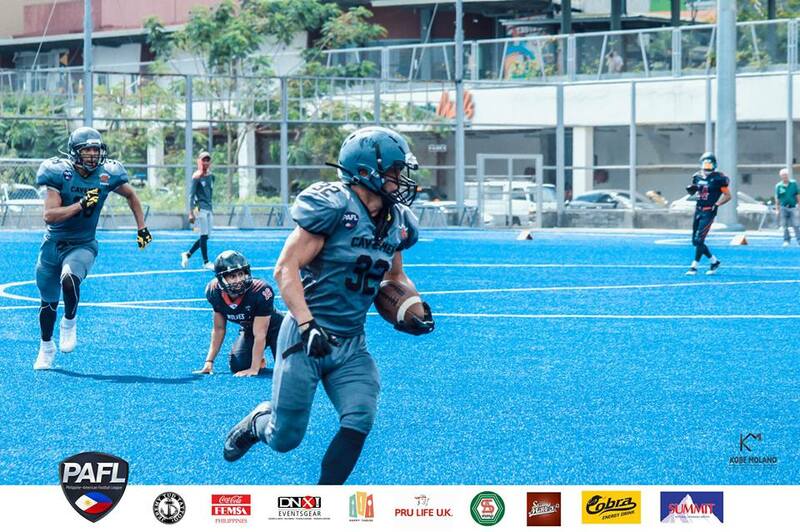 Cavemen wide receiver Paolo Orbeta gained 3 yards. Wil Yeh, playing running back, also ran the ball for yardage. Cavemen quarterback, Mike Hoese, decided to do a QB run which gained them about 5 yards. An encroachment violation was called on the Wolves defense which resulted in a free play. Unfortunately, the pass was incomplete and no gain was made. The Cavemen made it to the first down with a pass but was stopped by Wolves safety Khalil Tan. Yeh continued to gain a few with run plays. In an attempt to gain father, the Cavemen decided to go for another pass but was intercepted by Wolves middle linebacker Kevin Cederquist. 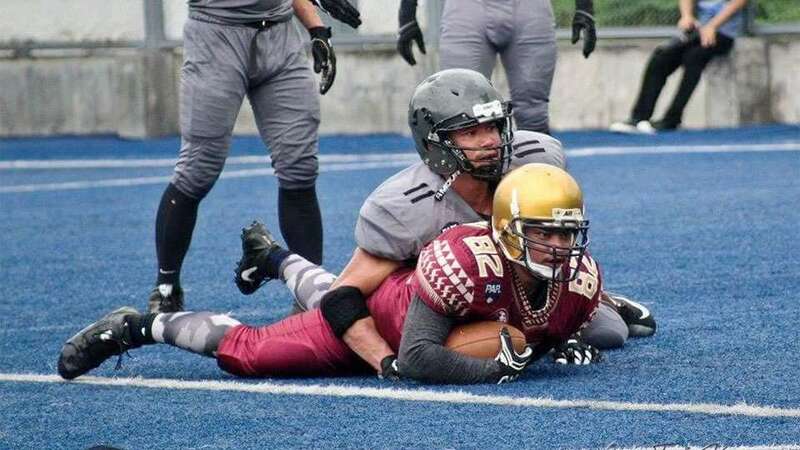 The pack immediately converted their possession into another touchdown with a pass to wide receiver Miguel Dela Peña and an extra point by Hill. The score was now at 14-0. The Cavemen offense turned to Nico Garcia to run the ball. 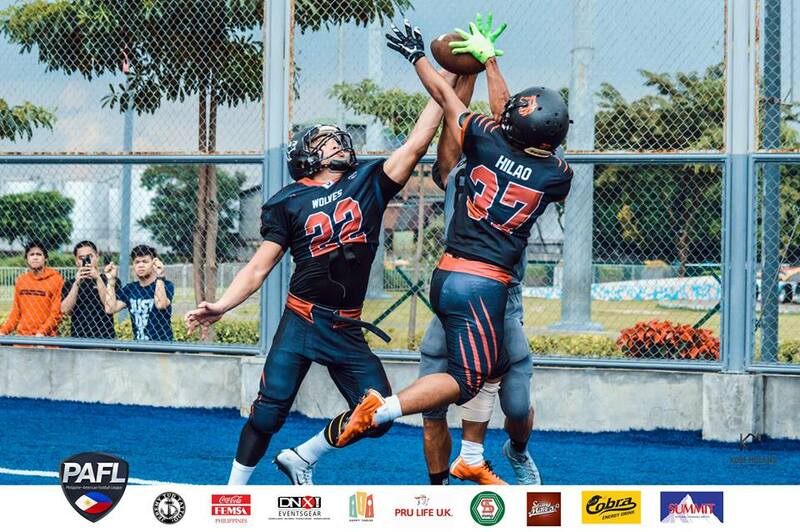 Passes were caught by cavemen receivers Robert John Laurel and Paolo Orbeta. The team started the 2nd quarter with a fresh set of downs. 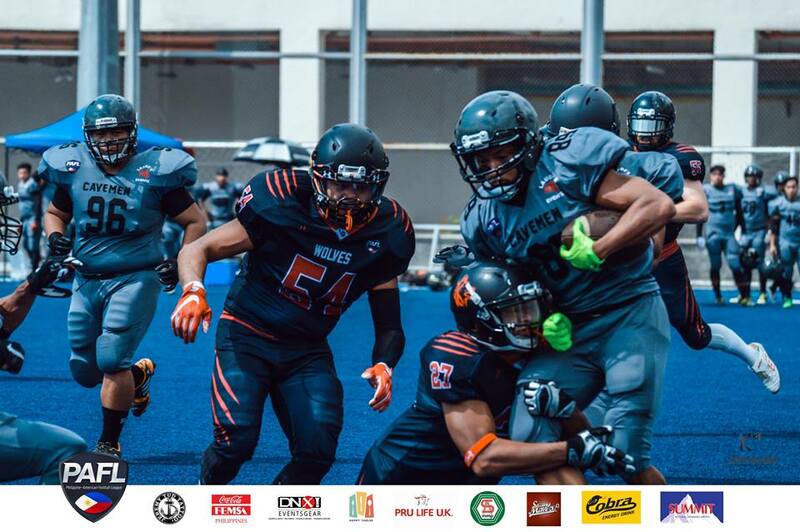 However, Wolves defensive end Jay Viernes sacked Hoese before he could pass the ball to his receivers. With the pack controlling the pace of the game, another interception was made by Cederquist with a 63-yard run. But he [Cederquist] was tackled with a forced fumble by the Cavemen offense. The ball was recovered by Wolves outside linebacker Darwin Gonzales. The Wolves did a run play with Gaita to gain 5-yards. They decided to go for a QB sneak to gain 2-yards then called for a timeout. 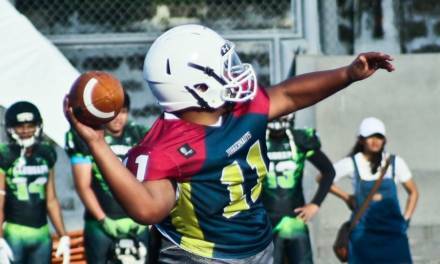 Zetazate [quarterback] called for another run which gave them the 1st down. Jumola reached the 1st down again after a series of run plays as cavemen defense, Vic De Guia and Santiago, go for the tackles. The Wolves offense tried to trick the Cavemen defense by prolonging the snap count which in turn made the defense do another encroachment violation. However, the pack did not gain enough yards to get the touchdown. They attempted a field goal and got the 3 points. The score was now 17-0. The Cavemen started at midfield. Their running back, Karel Coldenhoff, gained yards for their first play but the succeeding passes were incomplete. 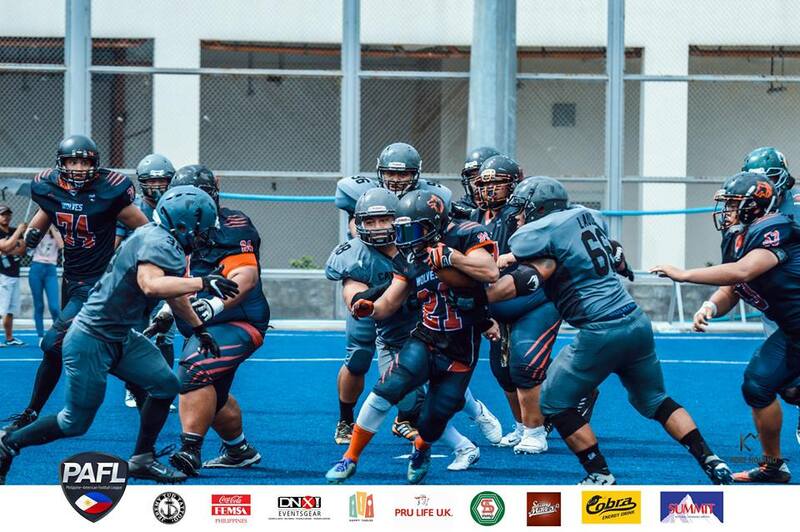 The defense [Wolves] showed that they will not back down as defensive end Dino Yuzon went for the sack and was assisted by another defensive end Chard Artista. A turnover on downs gave the Wolves the possession. Another run play was done by Jumola with a 3-yard gain. 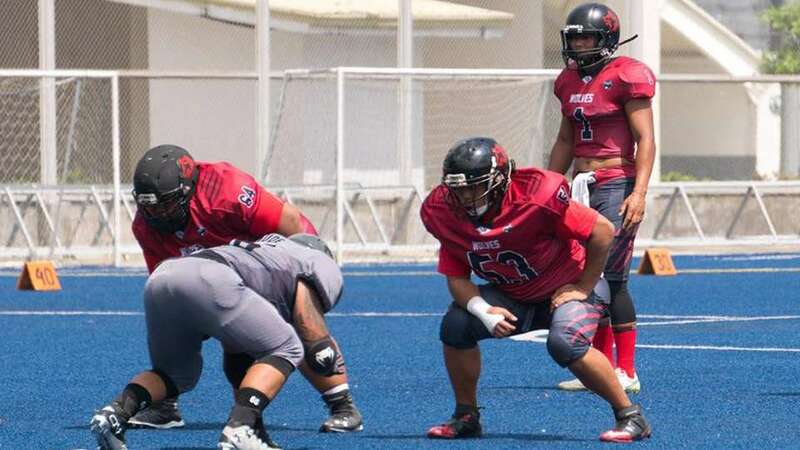 Multiple injuries were obtained by the pack as Zetazate [quarterback] and Karl Ver [center] went out of the field for a remainder of the possession. The offense struggled with their remaining downs as Jumola tried to run the ball again but was not able to get the 1st down – they decided to attempt another field-goal. 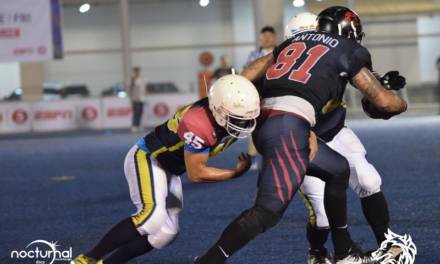 The first-half ended with the Wolves scoring on the field-goal – the score was at 20-0. The Cavemen started the 3rd half with a 12-yard return. Their offense started 60 yards from the end zone. Yeh initially gained 2-yards but got the 1st down on his next attempt with a 7-yard run. Gonzales [Wolves linebacker] and Yuzon [Wolves defensive end] covered Yeh’s runs. Patrick Gunnacao, another Wolves defensive end, sacked Hoese before they can complete another play. In another attempt to gain yards, the ball was passed to Orbeta [Cavemen receiver] but was covered by Wolves cornerback Pete Macaranas. The Cavemen offense did not show any fear as they went for their 4th down. The pass was thrown upfield to Orbeta again but was denied more yards by another tackle by Macaranas and an assist by Tan and Gonzales. Gawin Campbell, who is normally seen on Wolves defense, took over as the quarterback. They started with a pitch to Gaita for a 6-yard gain. The offense lost its momentum with a 10-yard loss due to a bad snap and an interception shortly after by Yeh [Cavemen defense]. Jumola made the tackle at the Cavemen’s 5-yard line. The Cavemen did not waste their advantage as Coldenhoff [running back] went for two consecutive run plays and scored their first touchdown of the day. 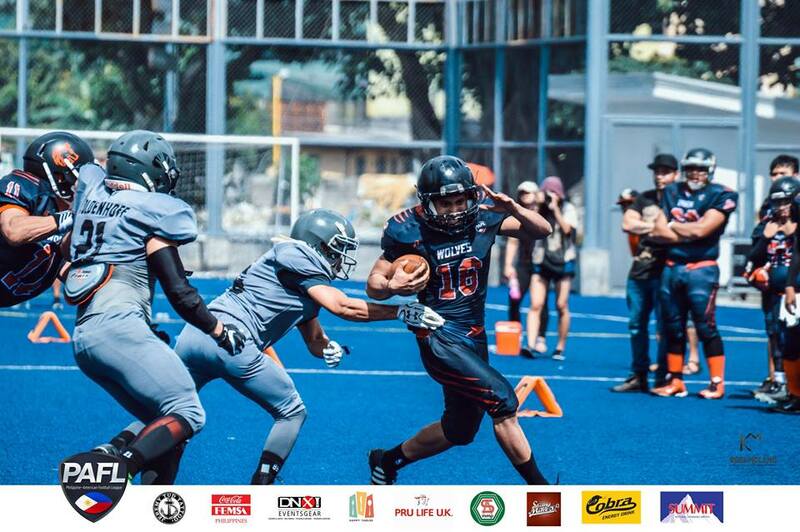 Seeing as they need more points, they [Cavemen] went for a 2-point conversion and got the score with a pass to receiver Vic De Guia. The score was now at 20-8. The Wolves offense started at mid-field after the kick return. Zetazate went back into the game as the quarterback. They relied on their run plays to gain yards. A personal foul was called on the Cavemen defense which resulted in a 15-yard penalty and an automatic first down. 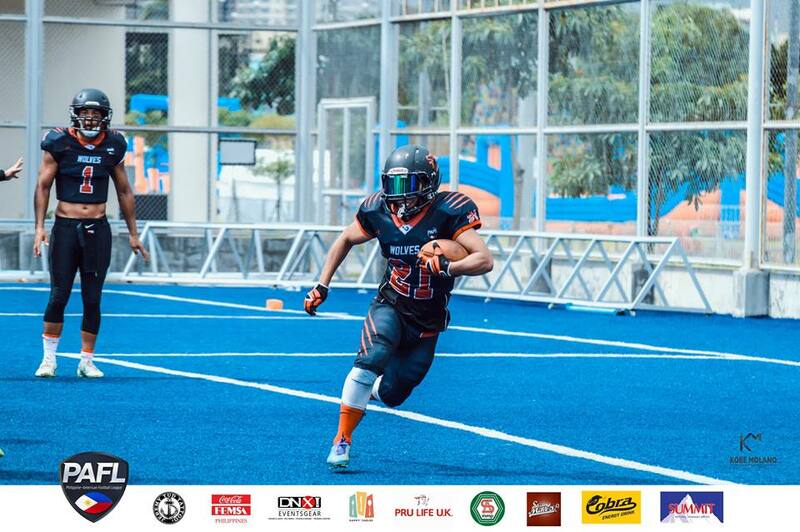 Gaita assumed the position of running back and was able to gain more. Not before long, another violation was called against Cavemen defense, JP Suarez, which gave another 15-yard penalty and automatic first down. With the pack already at the red zone, Jumola ran the ball to gain 7-yards. 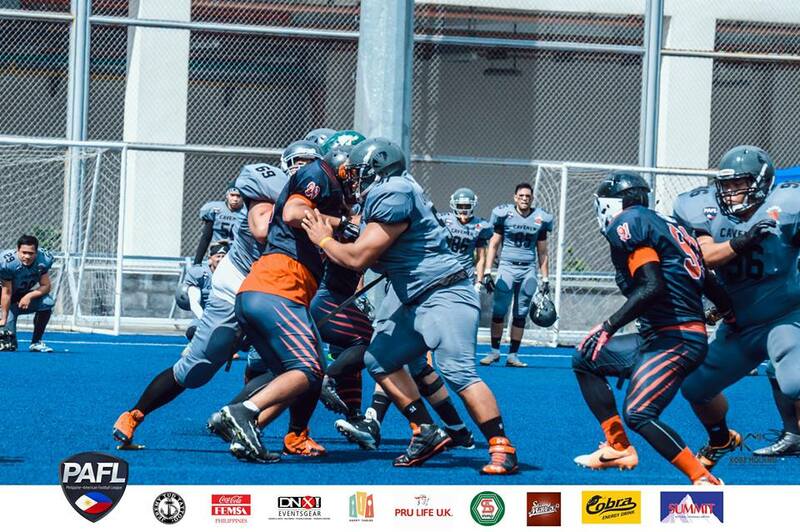 Unfortunately, a holding violation was called on Wolves offensive lineman Nico Sy with a 10-yard penalty. The offense opted to use Gaita and Jumola respectively for their succeeding plays. Offensive linemen were seen pushing Jumola to gain more yards but as the referees blew their whistles, they called a personal foul on Sy with another 10-yard penalty. But it did not stop there as the referees called a false start on the offense and lost them another 5-yards. In their last down, the pack decided to punt the ball. The Cavemen started at their 20-yard line. The 3rd quarter ended with a reception by Cavemen receiver Nico Garcia. The last quarter started with a run play by the cavemen offense. On their 3rd and short, Hoese went for a QB run and got the 1st down. Cavemen receiver Robert John Laurel made the reception before Wolves nose tackle, Ramon Borromeo, stopped him. 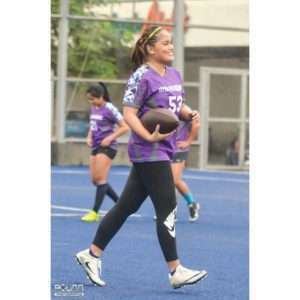 Dags Mambuay, Wolves cornerback, intercepted the ball and ran until the Wolves’ 10-yard line. However, this was nullified as referees called a flag [off-sides on the Wolves defense] before the interception – they were also given a 5-yard penalty. 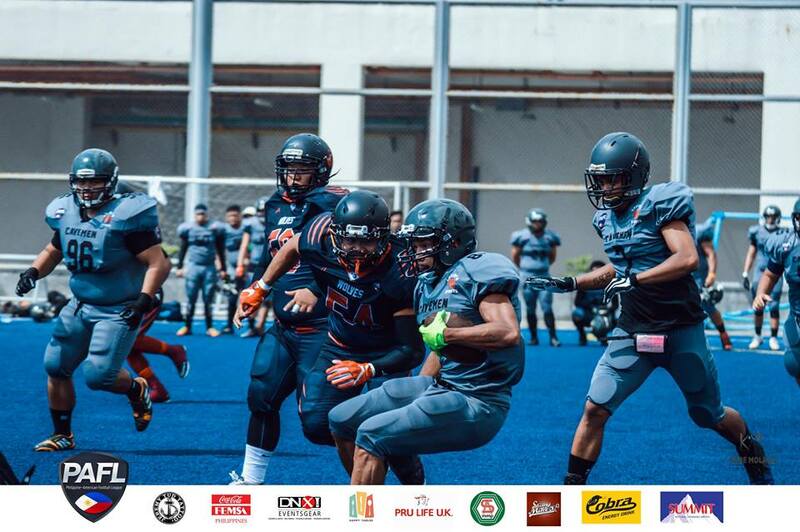 Shortly after with an incomplete pass to Inigo Pulido, officials called a pass interference violation on Mambuay resulting in a 15-yard penalty and an automatic first down. The Cavemen quickly converted their play to a touchdown with a pass to Nico Garcia. Their 2-point conversion was caught by Laurel. The score was now 20-16. The pack called a timeout right before the on-side kick. The Wolves offense seem to be struggling as some passes resulted in a loss of yards. The ball was pitched to Jumola for a 7-yard gain. An off-sides violation was called against the Cavemen defense with a 5-yard penalty and an automatic first down. With 7:30 left in the game, the pack seemed hungry to gain more with pass plays but receivers were unable to make the catches. Run plays however gained them more yards. Jumola got the 1st down before being tackled by Cavemen cornerback King Cunanan. The game became more intense as the Cavemen defense denied the pack with any yardage. The offense lost more yards because of another false start violation. Already on their 4th down, the Wolves decided to punt the ball. Dela Peña was able to secure the ball at the Wolves’ 5-yard line which puts the Cavemen offense near the Wolves’ end-zone. The Cavemen opted to go for passes to get away from the end-zone but was denied by the Wolves defense. Hoese takes a knee on the end-zone shortly after which resulted in a safety. Another violation was called against the pack for having too many men on the field. The Wolves also started their offense near the Cavemen end-zone. They gained yards with a run play to Jumola and a pass to Dela Peña. Jumola ran the ball out of bounds and was short on the 1st down right after the 2-minute warning. Having only about 2-yards away from getting a fresh set of downs, Zetazate decided to run for it but officials called it as no-good. The ball was turned over to the Cavemen. A minute and thirty was left in the game. Gian Mathay ran the ball but was stopped before he could gain more. Another pass was made to De Guia but was uncaught. Gonzales, wolves defensive end, made a sack with 1:20 left in the game but an off-sides violation was called on the pack again [5-yard penalty]. The offense went for a pass but was overthrown out of bounds. With their last down, they went for another pass but the pack’s defense had it covered and made the pass incomplete. At this point, the game clock only had 53 seconds left in the game. Players from both teams started shaking hands. The Wolves took a knee to end the game with a score of 22-16. 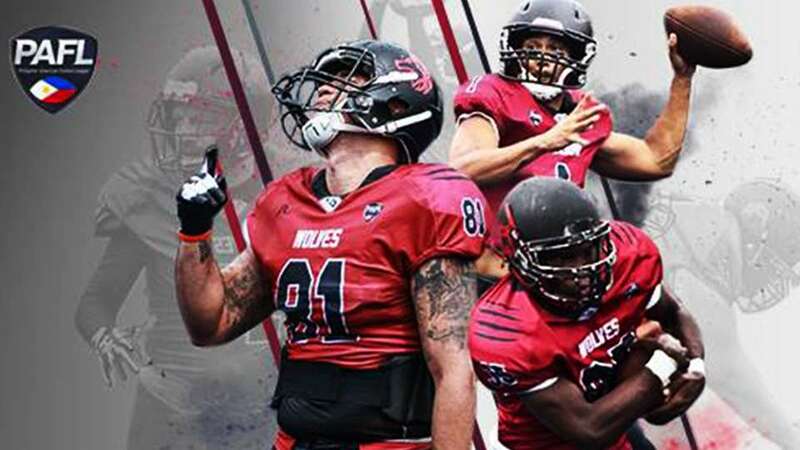 The Wolves are undefeated and are now the PAFL Season 2 Champions. We would like to thank the fans who came out and watched the games – and to the families who were always there supported our players. To our commissioner, Demosthenes Garcera Juanatas Jr., for making this season happen and for helping football grow in the Philippines. 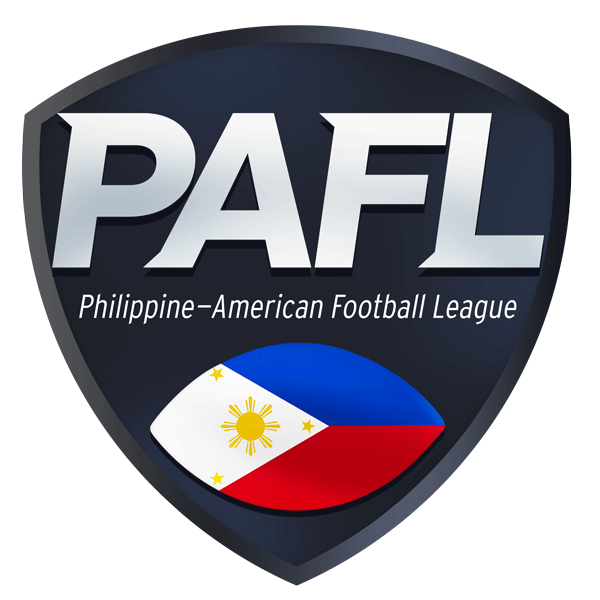 To the officials and PAFL committees who came to help out every game.I would like personally thank the PAFL newsgroup who made sure that the league is well advertised. Special mention to those who assisted me in making the articles: Nico Sy, Therese Edu, Darren Dario, Toots Vergara, and Raphy Plata Mukhi. We would also like to thank all of the teams who participated this Season, and are looking forward to a even bigger an better 2018 Season with more teams joining in on the action! If you and/or your team did not get to play this season but want to play next season, please contact us for more info on the 2018 Season. It has been an honor being a part of this season. Stay tuned for more news on Football.